So much for working hard to solve the budget. According to the following press release from the CRP, the Chairman of the Assembly Budget committee John Laird (D- Santa Cruz) decided to go to the Democratic National Convention. As California enters its 55th day without a state budget, assembly Democrats are urging Californians to call their Legislator and tell them to immediately pass a budget. That could prove to be difficult, however, because the Democrat Chair of the Assembly Budget Committee, Assemblyman John Laird (D-Santa Cruz) is partying it up in Denver at the Democrat National Convention. 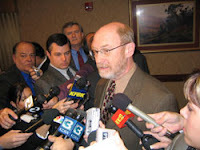 How can Assemblyman John “What Me Worry?” Laird abandon his duty as Chair of the Budget Committee during our fiscal crisis? There are 14 Southwest flights from Denver to Sacramento today…the people of California expect Mr. Laird to be on one of them. ← Save the Date: Sept. 20th is the Red County Red Meat Roundup!